City College of San Francisco (CCSF), established in 1935, is multi-cultural community college with campuses all over the city. The Ocean Campus was its first location and sits within Sunnyside’s official boundaries. Click here for an archive of the posts on this website about CCSF. Or visit the CCSF website. Since SNA was founded in 1974, the association has promoted a relationship between the neighborhood of Sunnyside and the college, enhancing mutual understanding and facilitating the flow of information. 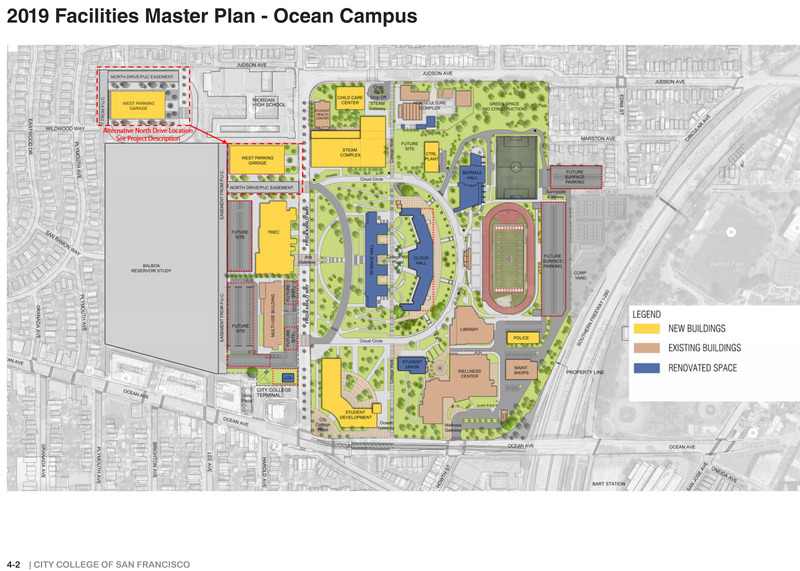 During 2016 CCSF developed a new plan for future changes on the Ocean Campus, called the Facilities Master Plan. Facilities Master Plan: This plan will guide development over the next several years. More about the process here. Here is the PDF of the current draft plan. In the past, members of SNA and other Sunnyside residents have been a part of the decision-making process during such revisions. Community workshops soliciting input from residents have taken place during the year. The full schedule of meetings is here (page down).